Stepping into The Brazilian Court feels like entering a private Palm Beach estate from another era. 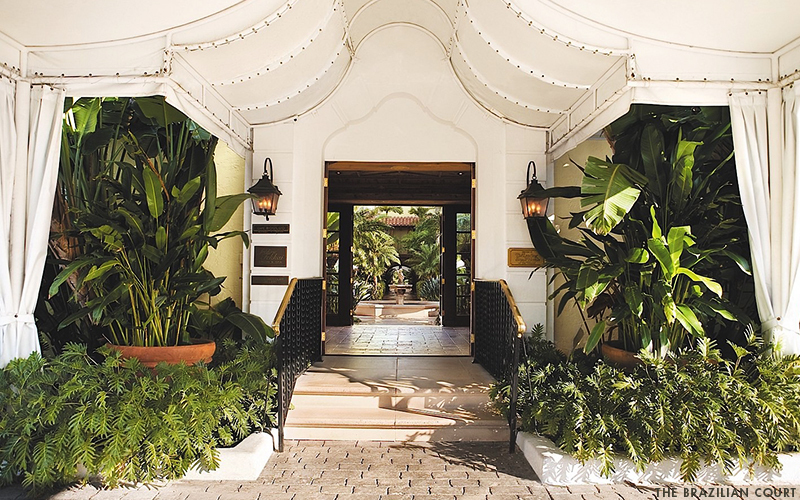 The 80-room hotel is built around two palm-filled Mediterranean courtyards. Lush banana palms, vibrant bird of paradise flowers, and fresh greens planted by landscape architect Mario Nievera, are woven through the courtyards’ colorful tile work and lemon yellow walls. 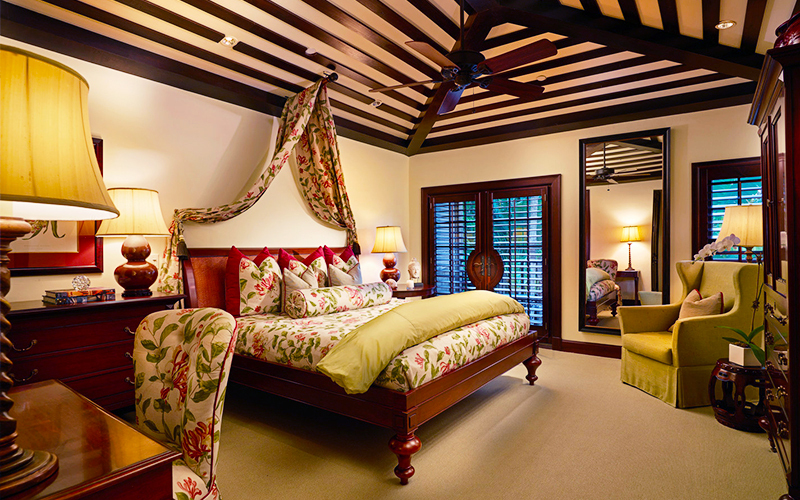 Inside, the rich detailing nods to the hotel’s 1926 origins—beautifully carved ceilings in local cypress, limestone floors, and solid mahogany woodwork—but with an updated contemporary twist. 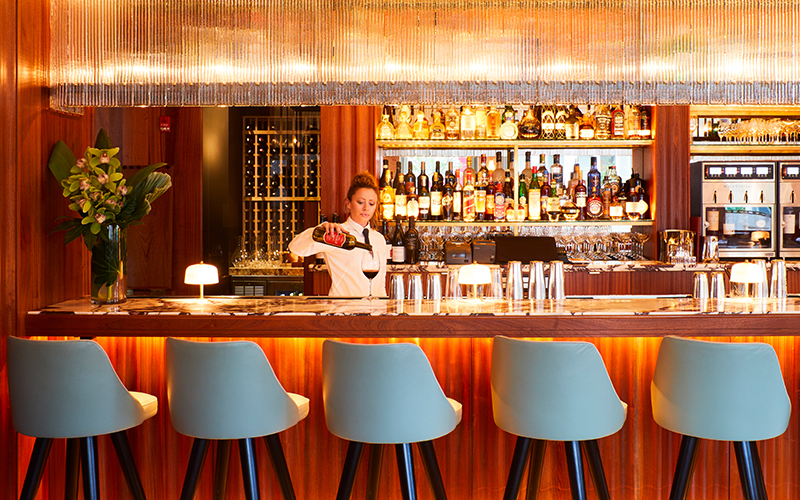 Other hotel highlights include Café Boulud and the Frédéric Fekkai Salon. The Breakers, built in 1896 on 140 acres along a stretch of beach, was modeled after an Italian renaissance palace. Palm trees line the drive up to its entrance, while two soaring trees frame the hotel’s twin-spired towers, manicured lawns, and palatial facade. The impressive lobby includes Venetian chandeliers, hand-painted ceilings, gold leaf detailing, and ornate tapestries, while the guest rooms are breezy and full of light in shades of white, sand, and aqua. Lounge in one of the private poolside cabanas for the full royal treatment. 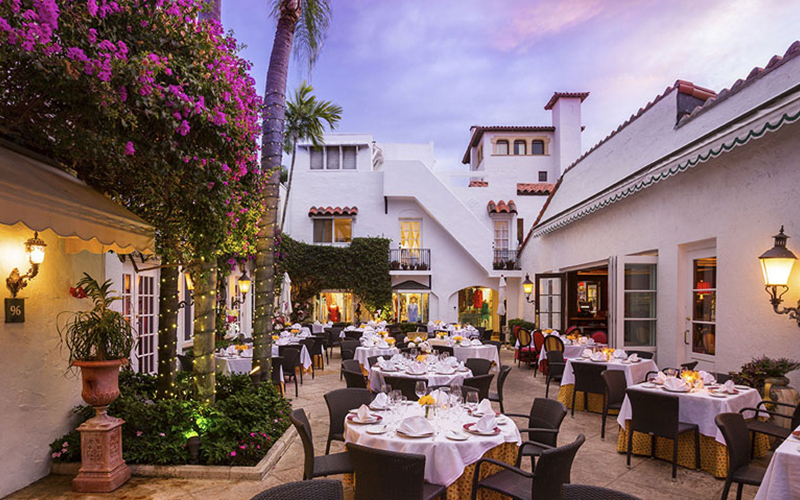 Renato’s is located on Worth Avenue, Palm Beach’s famed shopping corridor. The mood is elegant and relaxed; the food is fresh, delicious Italian with a rotating selection of handmade pastas. 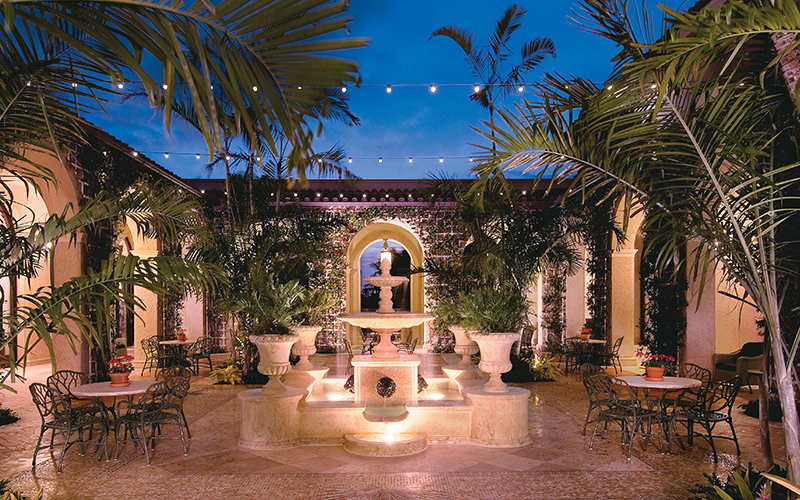 For a night out, I love the romantic courtyard. 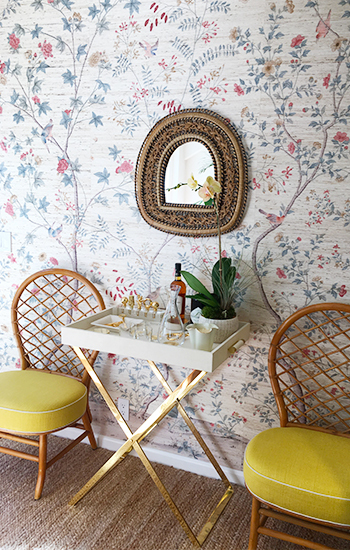 The Palm Beach outpost of one of my NYC staples, Sant Ambroeus, has an equally lovely ambience. This stylish Milanese ristorante, pasticceria, and gelateria has a mid-century-in-Milan aesthetic, with Murano glass light fixtures and Terrazzo floors in a sea motif. The saffron risotto is rich and delicious—perfect to share. Gelato, for one, is a must. I have been coming to Palm Beach since I was a little girl; the coastal style, from the colorful clothes people wear to the azure sea and sky, has definitely influenced my aesthetic. 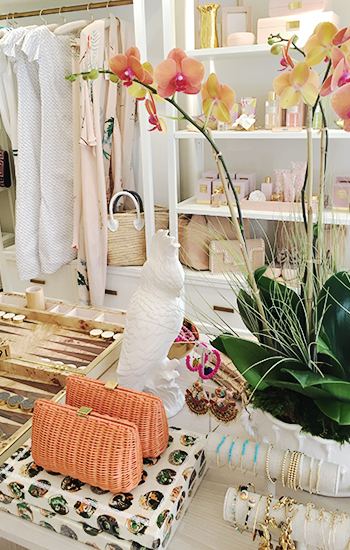 I’m looking forward to bringing our signature assortment of home, beauty, candles, and accessories plus a curated selection of exclusive products from some of our favorite brands to my new brick-and-mortar location. Worth Avenue is known for its shopping, but some of my favorite spots are on the charming, curvy vias that wind off the main street. 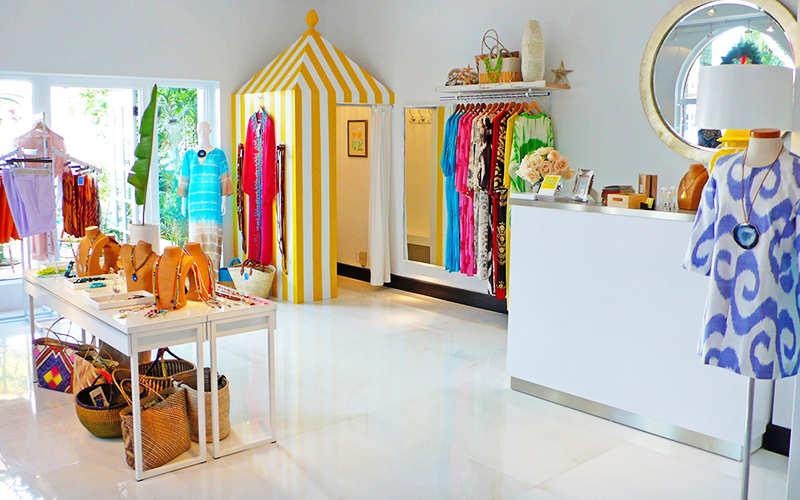 CJ Laing, on Via Mizner, has a bohemian-meets-preppy aesthetic that is irresistible. Look for brightly embroidered tunics and colorfully embellished straw clutches. One of my favorite places for gifts is Lori Bernstein’s store, Lori Jayne Monogramming. 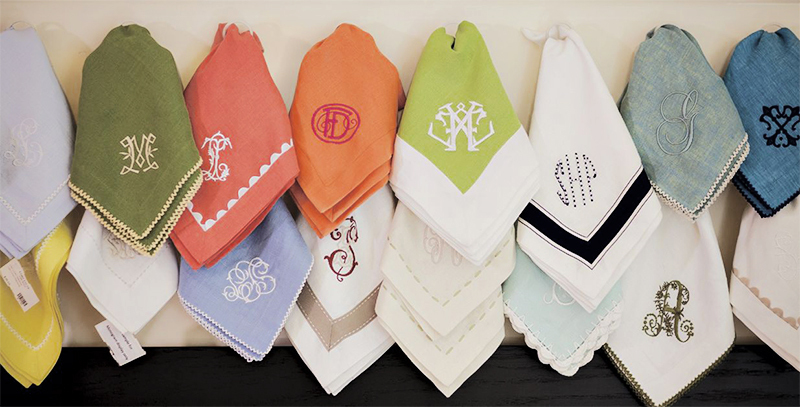 She has a wonderful selection of monogram styles and specializes in fine linens, but she can customize anything from pillows to a deck of cards. All work is done on-site, making customization quick and easy.